Lilies (Lilium) have four categories into which they're divided, Asiatic lilies being among them. The other three are longiforum, Oriental and a cross between these two. Asiatic lilies have a lighter aroma than the other three types, bearing medium-sized flowers. They come in a variety of colors, including orange, red, yellow, pink and white, like the Roma Asiatic lily. In ancient Rome, white lilies adorned the altars to Juno, and in Greece people dedicated lilies to Hera. Both deities protect women and children, giving white lilies the symbolic value of safety and sanctuary. Illustrations in Crete indicate that Minoans honored lilies as sacred as early as 1580 B.C. They attributed them to the Goddess Dictynna, who later assimilated into the Greek Goddess Artemis and the Roman Goddess Diana. Like Juno and Hera, these two goddesses protected women, particularly in childbirth. The deities also symbolize fertility and providence. This symbolism ties directly to the Greek marriage custom of placing white lilies on a bride's head entwined with wheat. This represented her purity and the wish for abundance. Ancient pagans used white lilies as decorations on May Day. On this holiday in Scotland people light fires and celebrate the beginning of Earth's fertile season. Part of the festivities include young women dancing around the May Pole with ribbons with lilies in their hair. The dance weaves the fates in search of a mate. In this setting lilies represent renewed life, health and fertility. White lilies appearing in dreams portend an upcoming marriage or other happy occasion. If you dream of lilies in winter, it presages loss or separation. Looking at a white lily flower in your dream means the success of a new endeavor and purity of intention. Tossing lilies away indicates ignoring important information or exploiting power. The Victorians created an entire language of flowers, or florigraphy. Lovers used this system as a way of sending silent messages when propriety would not allow for words. Presenting a white lily acted as an invitation to join the suitor for a walk or other engagement. It also symbolized respectful appreciation of a woman's purity and the great pleasure he enjoyed in her company. Aromatherapy practitioners feel that white lily flowers sooth nerves and deter stress. That gives them the symbolism of calm and peace. While practitioners often use lily oil, fresh flowers work equally well. In China people carry white lilies to attract luck and protect themselves from malicious spirits or the evil eye. Healers throughout this country use lilies similarly to aromatherapists to lift a person's spirits and stabilize emotion. Feng Shui practitioners use fresh or growing white lilies in areas of the home dedicated to money and relationships--the southeast and southwest corners of a room respectively. In this system the flowers represent prosperity and eternal love. White Asiatic lilies appear throughout the Easter season as symbols of virtue, hope and resurrection. 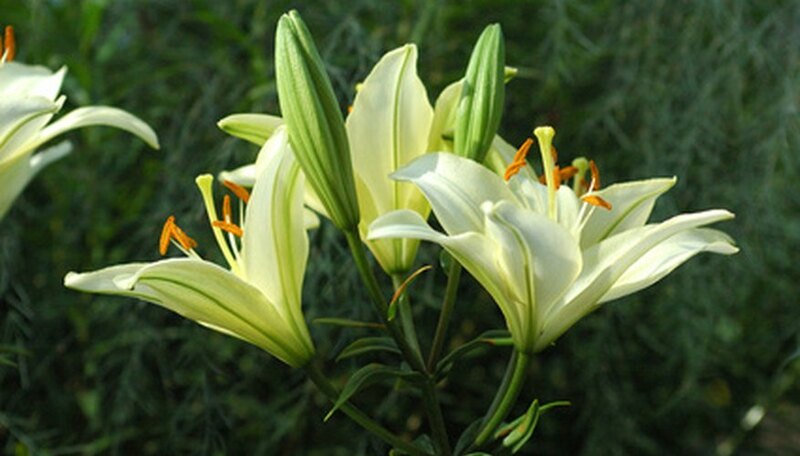 The Bible mentions lilies, one example being the Sermon on the Mount, where they represent simplicity and refinement. Lore tells us that lilies grew in the Garden of Gethsemane from Christ's sweat. Additionally, the Virgin Mary has associations with white lilies, particularly in art, where the Angel Gabriel gives her white lilies when he announces her pregnancy. White Asiatic lilies are highly toxic to cats. According to Cat World, the symptoms of poisoning appear within a half hour of consumption. These include vomiting and lethargy. If you suspect lily consumption, get your cat to the vet immediately since this can lead to death in five days.